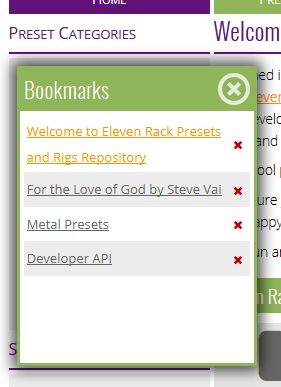 During the last couple of days I worked hard on some new features for elevenrack.net, which I hope will improve the user experience of the website and will drive more visitors and users. I am happy to share the latest additions today. The search functionality now supports search by letter, artist and preset title. Search by author is also on my list. If you like elevenrack.net and want to support it (I’d really appreciate that) and a really cool way, you are now able to embed preset widgets on your website just by registering widget’s HTML5 Web Component runtime and adding a simple tag to your website. Found a preset you love? Click the star icon next to the page title to store it in your very own favorites bar. To manage your favorites, click the star icon in the navigation bar. To remove a favorite – either click the “x” icon in the favorites popup or the yellow star icon to the right of the page title. Visited pages are now cached client-side during the session and loading them from the cache is at lightning speed. The JSON(P) data for all presets currently on the website is accessible via the REST API.